It’s June again, and the wedding season is upon us. It’s a time for celebrations of love, hope and the start of a new life together. Many of us will attend ceremonies, galas and festivities honoring couples who have pledged to love, support and sustain one another through life, and, regardless of the statistics, we’re always cheering for love to triumph. 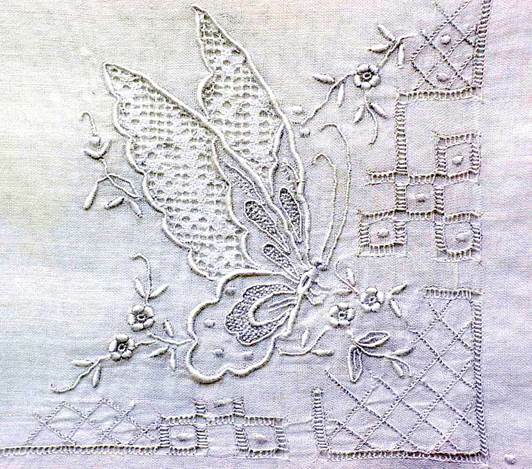 One popular image you’ll find embroidered on wedding gowns, veils, and bridal handkerchiefs is the butterfly. 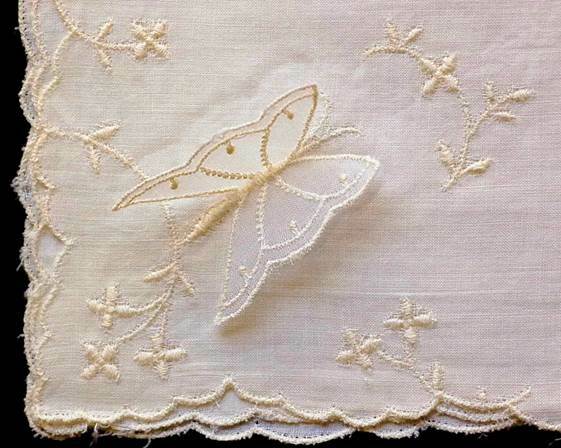 You’ll also find it on christening gowns and bonnets, as the butterfly symbolizes transformation, new beginnings and rebirth. 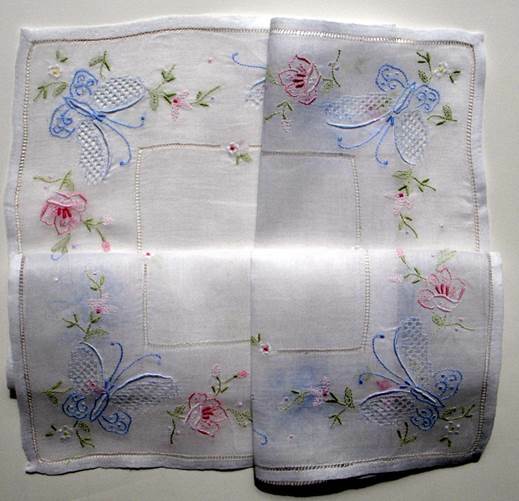 This sweet scallop-edged hankie contains both butterflies and a plethora of hearts in a charming pattern. 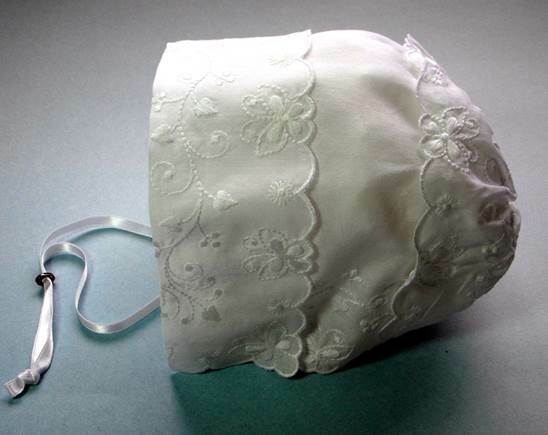 I transformed this hankie into a christening bonnet for a friend’s baby girl. 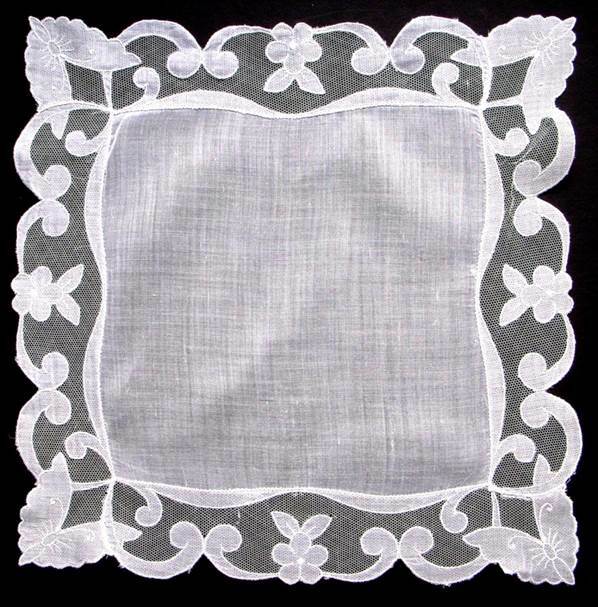 When she grows up, this same hankie will serve as her bride’s handkerchief to catch her tears of joy on her wedding day. 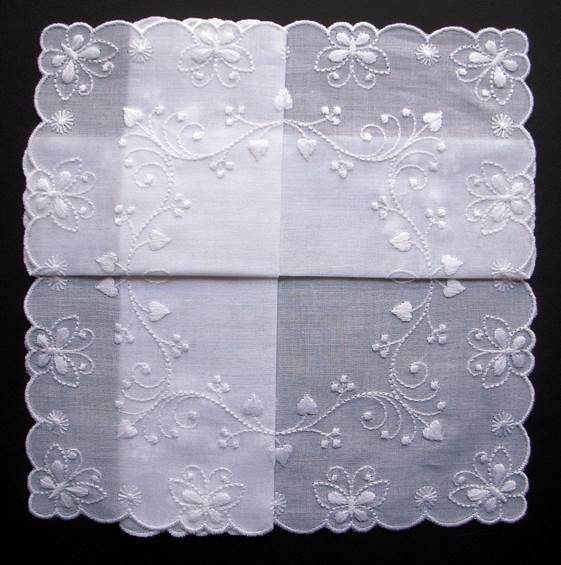 I began my collecting with wedding handkerchiefs. Many folks find them too plain, claiming they’re just white on white. Ah, but that’s the challenge. How much easier to fashion a striking image if you’re using giant sweeps of persimmon, chartreuse or purple in your design. How challenging it must be to convey your message – whether subtle and soft, or striking and spectacular, when limited to a palate of white on white. The artist beckons the viewer to come closer, closer, closer….to appreciate the hours, weeks and possibly months of work entailed in creating a handmade work of art. 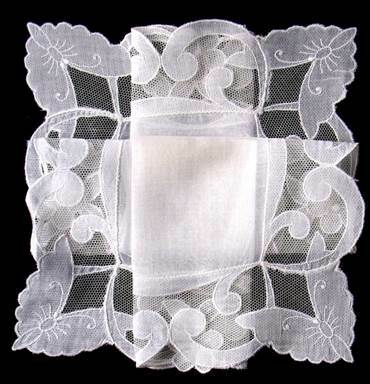 So too, the lace, embroidery, appliqué, drawn work, or bead work utilized in creating a wedding handkerchief, veil, or gown deserves our appreciation. You can’t rush craftsmanship any more than you can rush a relationship, particularly if you want the results to last. In generations past, young girls did hand work on their trousseau over several years, knowing they were creating something to last a lifetime, just like the marriage they hoped to have one day. So take your time and savor the details. Just like brides, there are no two alike, and each one will call to you in its own way. 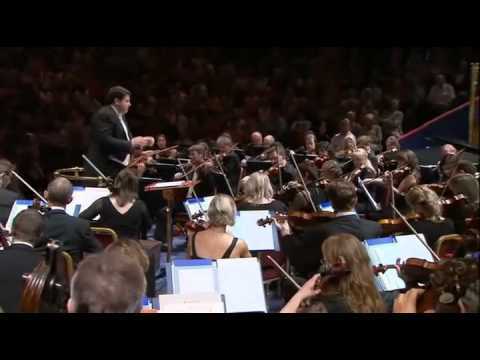 Performed by the Royal Philharmonic Orchestra conducted by Andrew Litton at the Royal Albert Hall. 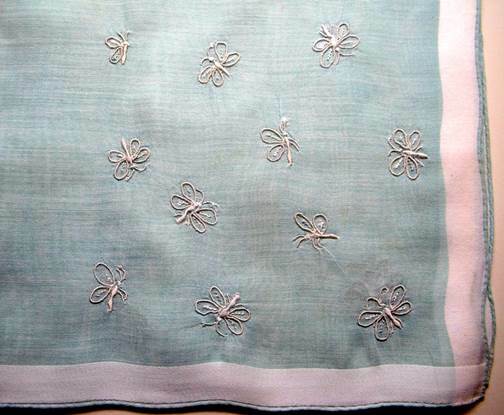 This elaborate lace handkerchief showcases butterflies in each corner, floating in a garden of roses and forget-me-nots. The delicate wings adds a lightness perfect to this ephemeral creature. The cut-work foliage that forms a second pair of fanciful antenna are reminiscent of a feather in a lady’s hat! 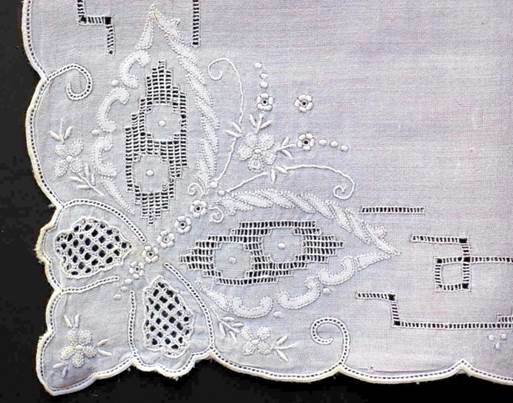 Foliage repeated along the scalloped border underscore the substantial cut-work motif in the wings. The craftsman of this piece combines embroidery, cutwork, appliqué, and a sophisticated scalloped edge, all pooled in perfect balance. The floral body is perfection. The ribbed wings create movement for the eye to follow – right up toward the fanciful floral crown fit for a queen. Oooohhh. Love the curling, overlapping antenna. The artist thought through every detail of this composition. The lace wings could lift this creature with the gentlest of breezes. The cut-work border anchoring the overall image underscores the conflict between freedom and feeling earthbound. A lovely creature in profile, its tiny legs about to alight on a minute flower. Observe the serenity of this creature with outstretched wings floating over the thinnest tendrils of vines. This to me showcases the perfection of the Asian aesthetic. Restrained, graceful, polished. 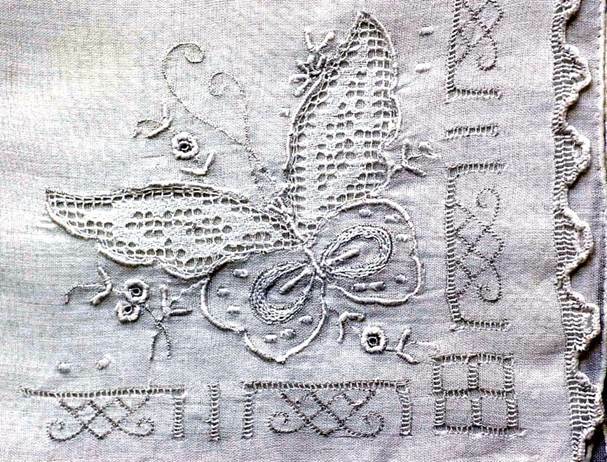 I adore the subtle simplicity achieved with appliqué. Tthese wings appear to float on air. 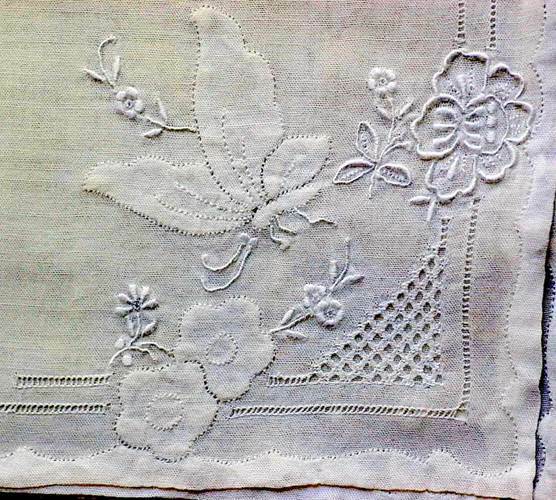 The interest in this design relies on the variety of handwork from appliqué to embroidery to cutwork. The depths and shades achieved illustrate how white on white can spring to life under the tutelage of a skilled hand. Here the artist allowed the wings to break free and flutter. 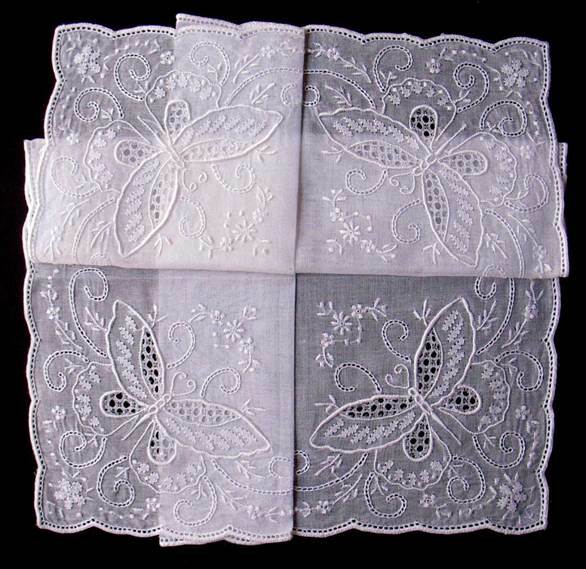 In Japan, geishas carried special “butterfly” handkerchiefs which contained a small hole directly beneath the wings of a delicate organdy butterfly. 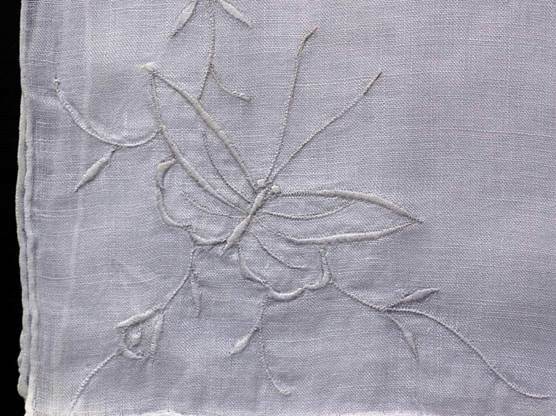 The tiny winged creature was tacked to the hankie with the finest of thread. When dangled in a summer breeze, the wind would pass through the hole, and flutter the butterfly’s wings, enabling the lady to draw attention to herself, while retaining her silent and subtle demeanor – flirting at its finest! 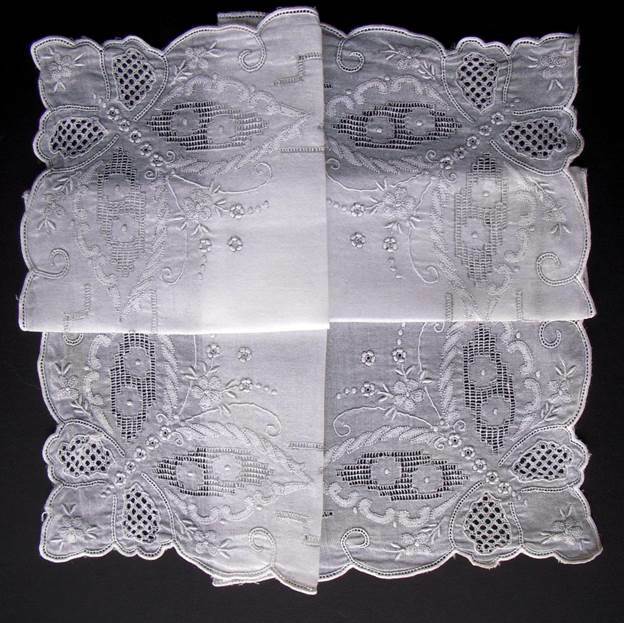 The cutwork and net lace on this handkerchief create a border bold yet simultaneously soft. Reduced to a simple graphic, the image appears elegant, but not fussy. It’s the perfect accoutrement for a bride who wants to convey classic clean lines with just a soupçon of romance. 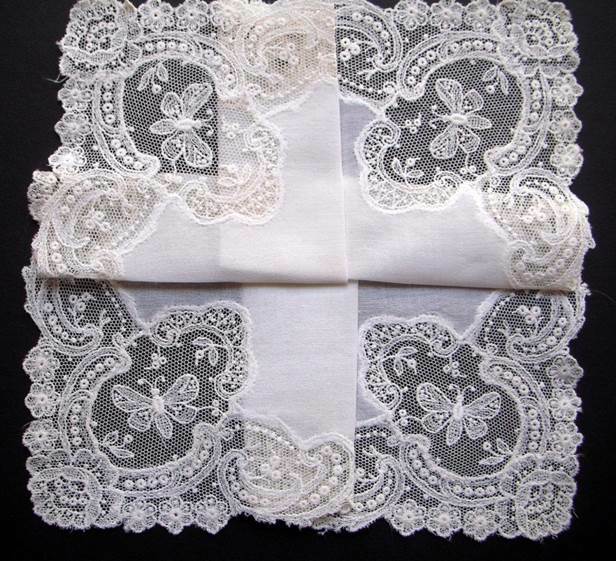 Tradition has it a bride should carry something old, something new, something borrowed, something blue, and a sixpence in her shoe… The following handkerchiefs contain a touch of blue and would certainly be cherished by any traditionalist or sentimental bride-to-be. This one is particularly fun and youthful. Simply charming. What other creature starts life crawling at the slowest pace and transforms into a winged wonder that can migrate up to 3000 miles? Who among us hasn’t wished at least once in our lives to have the power to take flight? Because of its gift of metamorphosis, the butterfly has accrued many legends across cultures and centuries. The ancient Greek word for butterfly means “soul.” In Japan, too, a butterfly was considered the personification of a person’s soul. One superstition says if a butterfly enters your home and perches, the person you most love is coming to see you. Butterfly Lovers is a famous Chinese folktale, and in their culture, two butterflies flying together symbolize love. In some Native American tribes, butterflies have the power to carry your wishes skyward to the gods. Many cultures believe the butterfly to be a messenger from the spirit world. White butterflies symbolize good luck. I f one lands on your shoulder, it has come to bring you comfort. If a white butterfly visits you at an important moment in your life, it may represent a guardian spirit helping you along life’s path. What better symbol then, to carry on your wedding day? To believe that in some small way, all those in heaven who love you are with you and sending their support and love. 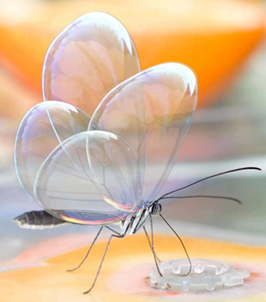 This glass butterfly proves color is unnecessary when you’re basic nature is already spectacular. I have heard of quilting conventions which include handkerchief quilts, but I’m unaware of any conventions focusing strictly on handkerchiefs. Readers, please do chime in and let us know!